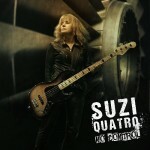 Share the post "Album review: SUZI QUATRO – No Control"
Now I get it, having enjoyed a career that has lasted over fifty years, Suzi Quatro is the woman that paved the way for most female rock artists that followed – Hole, Heart, Hynde, the list goes on – and the opening track, ‘No Soul/No Control’, from her new album kinda waves the flag for that and sets the pace for the rest of the record. There is a great melting pot of styles across the eleven tracks on No Control and it would be unfair to just gloss over them so let me give you the rundown. ‘Going Home’ has a deep down south feel with a driving rhythm section and some great B3 work, you get the feeling of a woman scorned here, and that seems to be a feeling that threads throughout the album at times. With its horns and its harmonies, ‘Strings’ is a more funky, soulful affair and is one of the standout tracks on the record. It’s an unusual song in some ways and that is the beauty of it. ‘Love Isn’t Fair’ is the only track that doesn’t really sit right with me, almost calypso like it reminds me of Blondie and would fit in on an episode of “Death In Paradise”. ‘Macho Man’ is straight ahead boogie rock, think Quo meets Quatro’s earlier hits and you’ve pretty much nailed it on the head, it’s all in the drums, no wonder she views this as the perfect opening track for her live shows. ‘Easy Pickings’ is a nice bluesy shuffle, featuring some great harmonica playing and is followed by ‘Bass Line’, again rooted in the blues but this time with a cleaner piano-led feel to it. Another highlight, for me, is ‘Don’t Do Me Wrong’, just a great slice of bass driven blues rock. Sound wise both ‘Heavy Duty’ and ‘I Can Teach You To Fly’ are a nod back to Quatro’s glam rock days and the latter is another standout track. Then we have a big old blues number to close the album in ‘Going Down Blues’. This entry was posted in ALBUM REVIEWS, ALBUM REVIEWS (Mobile), All Posts and tagged album, bass, blues rock, boogie, classic rock, hard rock, No Control, review, Richard Tuckey, Suzi Quatro. Bookmark the permalink.